Another thing I love about the summer is the ample amount of events held all over Astoria and LIC. 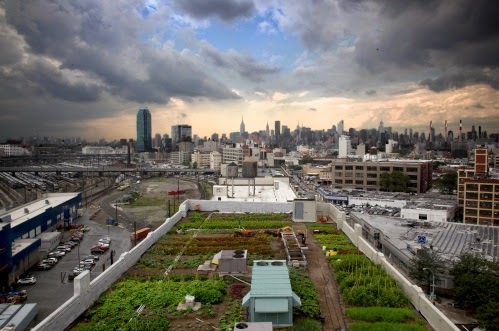 I also love it because LIC's Brooklyn Grange rooftop farm is in full swing, bearing a bounty of fresh produce for all of us to enjoy. Aside from the raw veggies you can get at their Farmers Market, they're also bringing back the series of Butcher Paper dinners. Allowing us to enjoy the facilities of the farm, including the awesome open air atmosphere of the rooftop, the Butcher Paper dinners bring together the community with a great local restaurant or food producer. The beauty of these dinners is that they're truly communal, hosted on the farm's massive reclaimed wood table, enabling guests to mix, mingle and share not only food but experiences. Here's more info about their first event, which takes place at the end of this month. I hope you get to experience it! Sunday, July 20th at 5 p.m.
Momo Sushi Shack is bringing some asian flair to the farm with seasonal seafood and ever-popular pork belly, all in very finger friendly formats. The guys making the magic happen, Phillip Gilmour, Chance Johnston, Ismael Alvarez and Makoto Suzuki, opened Momo Sushi Shack in 2010, combining fresh American ingredients with traditional Japanese technique. The result is a tremendously popular spot in Bushwick that has received rave reviews from Yelpers (a true achievement), as well as a Michelin Guide recommendation. Their food is enough to win anyone over, but we love them even more for their commitment to sourcing locally from places like Heritage Food, Bushwick Campus Farms, and Brooklyn Grange! So pop on up, ready your palate, grab a brew from Queens Brewery or some chilled white wine courtesy of Boundary Breaks, and kick back for a summery Sunday Butcher Paper Dinner! 5pm - 6pm: Arrival, farm tours, cocktail hour. Wander and enjoy!